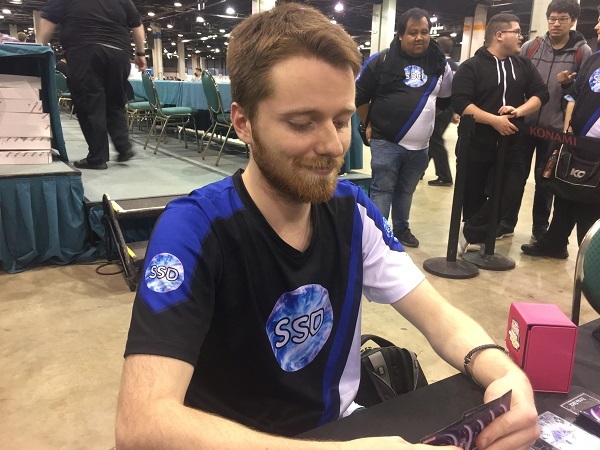 Alex Mondlak from Westerville, Ohio is Dueling against Denis Nadas from Albuquerque, New Mexico in the Top 8 of YCS Chicago! 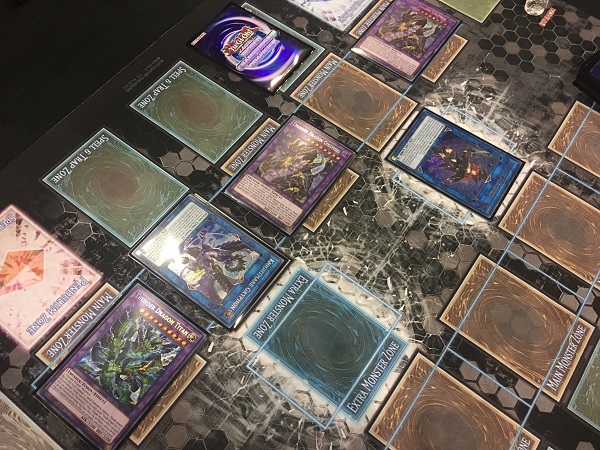 Mondlak placed his hopes and dreams of a YCS victory in his Cyber Dragon Deck, while Denis Nadas is counting on his Thunder Dragon Danger! Deck. One of these Duelists will advance to the Top 4. The other will be eliminated. It’s time to Duel! Nadas started off Duel 1 by activating Allure of Darkness to draw 2 cards and banish Thunder Dragonroar from his hand. He activated Dragonroar’s effect to Special Summon Thunder Dragondark from his Deck and then Normal Summoned Phantom Skyblaster. He activated its effect to Special Summon 2 Skyblaster Tokens to the field and then used 1 Token to Link Summon Link Spider. He then revealed Danger!? Tsuchinoko? to activate its effect and randomly discarded it from his hand and Special Summoned it. He used the effect of Danger!? Jackalope? in his hand next, and randomly discarded Danger! Nessie!. He Special Summoned Jackalope and drew a card, and then added another Jackalope to his hand with Nessie’s effect. He gave up Link Spider, a Token, Thunder Dragondark, and a Jackalope to Link Summon Saryuja Skull Dread and then used the effects of Saryuja and Thunder Dragondark. He drew 4 cards and put 3 cards from his hand on the bottom of his Deck and then used Thunder Dragondark’s effect to add Thunder Dragon Fusion from his Deck to his hand. He activated Melody of Awakening Dragons by discarding a Jackalope and added 2 copies of Chaos Dragon Levianeer from his Deck to his hand. He then used the effect of his discarded Jackalope to Special Summon Nessie from his Deck. He sent Phantom Skyblaster, Nessie, and Tsuchinoko to the Graveyard to Link Summon Curious, the Lightsworn Dominion and used Curious’s effect to send Eradicator Epidemic Virus from his Deck to his Graveyard. He then used Curious’s effect to send Tsuchinoko, Nessie, and White Dragon Wyverburster from the top of his Deck to his Graveyard. He used Saryuja’s effect to Special Summon Thunder Dragonmatrix to his field and then banished 2 Nessies and a Skyblaster from his Graveyard to Special Summon Chaos Dragon Levianeer. He used its effect to shuffle a card from Mondlak’s hand into his Deck. Nadas then sent Thundermatrix and Curious to the Graveyard to Link Summon Knightmare Gryphon. He activated Gryphon’s effect by discarding Levianeer. He Set Eradicator from his Graveyard, drew a card, and added a Dragonmatrix to his hand. He activated Allure of Darkness next to draw 2 cards and banish a Thunder Dragondark from his hand. He discarded Thunder Dragonhawk from his hand to Special Summon Thunder Dragonroar from his Banished Zone. He sent Saryuja and Levianeer to the Graveyard to Link Summon Reprodocus and then Special Summoned Wyverburster behind it. He activated Reprodocus’s effect to make Wyverburster a Dinosaur and then Link Summoned Summon Sorceress. He added Black Dragon Collapserpent to his hand and then Tributed Dragonroar to Special Summon Thunder Dragon Colossus linked to Sorceress. He used Sorceress’s effect to Special Summon Thunder Dragon from his Deck and then activated Thunder Dragon Fusion to Special Summon Thunder Dragon Titan. He then Tributed Thunder Dragon to Special Summon another Colossus from his Extra Deck. Mondlak opened up with One for One, Cyber Dragon, Galaxy Soldier, and 2 copies of Machine Duplication. He drew PSY-Framegear Gamma for his turn and then entered his Battle Phase. Nadas flipped Eradicator Epidemic Virus calling Spells, and Mondlak revealed his hand and conceded, completely overwhelmed by Nadas’s field. Denis Nadas takes a commanding victory in Duel 1 with his Thunder Dragon Danger! Deck! Mondlak chose to go second in Duel 2. Nadas activated Allure of Darkness to draw 2 cards and banish Thunder Dragonroar from his hand. He activated its effect to Special Summon Thunder Dragondark from his Deck. Next, he activated the effect of Danger!? Tsuchinoko?. He randomly discarded Thunder Dragondark from his hand, Special Summoned Tsuchinoko, and drew a card. He activated Jackalope’s effect next, randomly discarding Nessie. He Special Summoned Jackalope, drew a card, and then added another Jackalope from his Deck to his hand with Nessie’s effect. He activated Allure of Darkness to draw 2 cards and banish Thunder Dragondark from his hand. Next, he activated the effect of Thunder Dragonhawk in his hand to Special Summon Thunder Dragonroar from his Banished Zone. He activated the effect of Jackalope in his hand, and randomly discarded it, allowing him to use its effect to Special Summon Nessie. He combined 4 of his monsters to Link Summon Saryuja Skull Dragon! He activated Dragondark’s effect as Chain Link 1 and Saryuja’s effect as Chain Link 2; but Mondlak activated the effect of PSY-Framegear Gamma in his hand as Chain Link 3 and Special Summoned it to the field along with PSY-Frame Driver from his hand! He negated the activation of Saryuja’s effect and destroyed Saryuja, and Nadas added a Thunder Dragon Fusion to his hand. 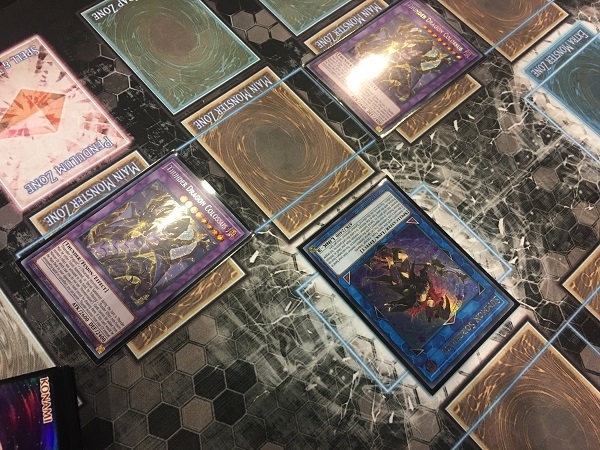 Nadas banished 3 DARK monsters from his Graveyard to Special Summon Chaos Dragon Levianeer and used its effect to shuffle a Cyber Dragon from Mondlak’s hand back into his Deck. He activated Thunder Dragon Fusion next, returning 3 of his Thunder Dragon monsters to his Deck to Fusion Summon Thunder Dragon Titan from his Extra Deck. Next, he sent Levianeer and Titan to the Graveyard to Link Summon Reprodocus. He Normal Summoned Tsuchinoko behind it and then turned it into a Dinosaur with the effect of Reprodocus. He Link Summoned Summon Sorceress, used its effect to Special Summon a Thunder monster from his Deck, and then Special Summoned 2 copies of Thunder Dragon Colossus linked to Sorceress by Tributing the 2 Thunder monsters in his Main Monster Zones. Mondlak drew a card and conceded, unable to use any of the cards left in his hand. Denis Nadas is moving on to the Top 4! QQ: What is Your Favorite Change to the Forbidden & Limited List? 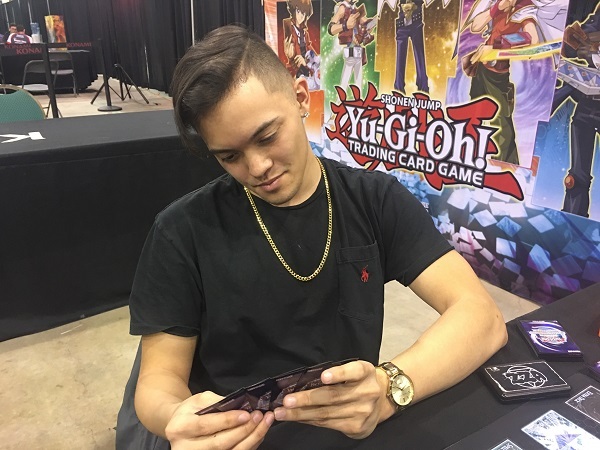 YCS Chicago Top 8 Pairings and Decks!